If you mention the word transite to about 90% of the population, they either think of HVAC ductwork installed below the concrete floor in a basement, or they assume you added an “e” onto the word transit. This ought to change. The vast majority of sub-slab ductwork is not transite, and shouldn’t be labeled as such. Also, there’s no such thing as “transit” heat. Some spell-checker created this word by chopping off the letter e. It’s transite. I’m no historian, but I’ve always been taught that transite was a cement-asbestos product. Wikipedia agrees, describing Transite as a brand created by Johns-Manville in 1929 for cement-asbestos products. At some point, the product transitioned from Transite to transite, just like Romex became romex and Sheetrock became sheetrock. At least in everyone’s minds. The two components in a home that are most appropriately called transite are cement-asbestos gas vents and cement-asbestos sub-slab ducts. That’s right, most sub-slab ductwork here in Minnesota is not made from transite. It’s mostly PVC. When this ductwork is called transite, it’s implied that the ductwork contains asbestos. 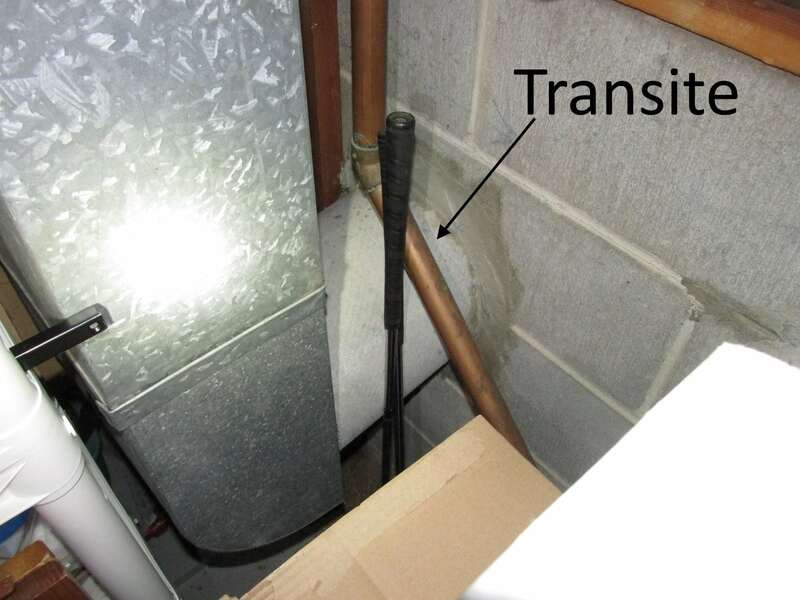 Don’t call it transite if the ductwork is not made from cement-asbestos. This creates confusion and unnecessary concern. Call it sub-slab ductwork. Transite ductwork was used in the 1960’s and early 1970’s. So what’s the concern with actual transite sub-slab ductwork? Asbestos. The cut edges of this material are often rough and have the potential to release microscopic asbestos particles into the air if disturbed. The term for this condition is “friable”. This means that the ductwork probably shouldn’t be cleaned, for risk of creating an environmental hazard. Don’t expect your duct cleaner to know this, however. If you hire them to clean your ducts, they’ll clean your ducts. Home buyers generally don’t like the idea of not being able to have their ducts safely cleaned. If you buy a home with transite heat, this is what you’re getting. It’s not the end of the world, but there’s also no simple fix. The images below show some examples of what this looks like. The first image shows a rare view of the outside of a transite heat duct. 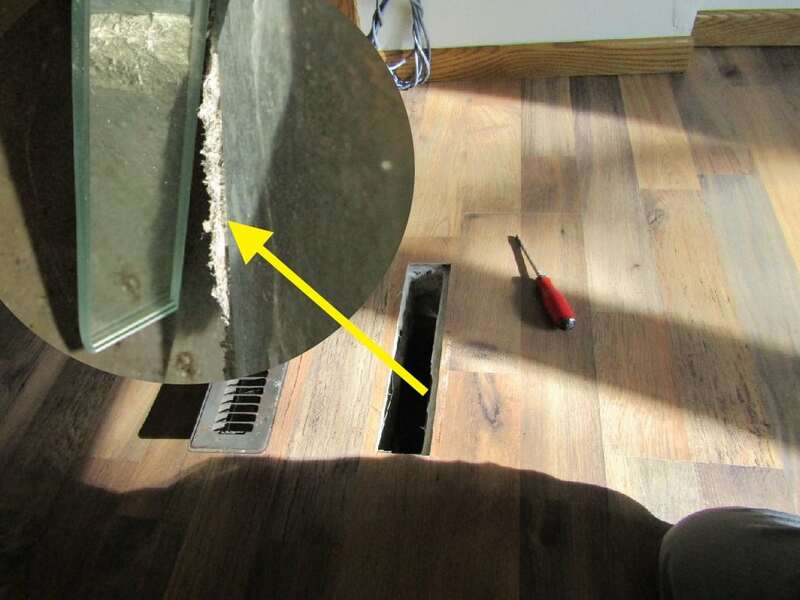 In most homes, this portion of the duct is buried below the slab. It’s only visible in this case because it was in a split-level home. The image below shows a floor register cover removed so we could look inside the duct with our furnace inspection mirror. I mentioned this mirror in my home inspection tool list. Every home inspector ought to have one. The rough, fibrous edges of the ductwork indicated by the arrow are the telltale sign that this is transite. Here’s a view of a transite duct from the inside. Click on the image for a larger, more detailed version. Note the spiral, and note the rough fiber. This is transite. Also, make note of the obvious water staining in the ductwork. This ductwork has surely been flooded in the past, and that brings me to my next topic, which is water in sub-slab ductwork. That’s a topic all on its own, so please come back next week for my blog post on water in sub-slab ductwork. You mentioned the concerns with having this type of duct work cleaned but what about normal air movement through these ducts? Is this a concern as well with friable edges? Is it OK to have this material as long as you don’t try to clean it? Just wondering what you would recommend to your clients. Do you have any thoughts on “Duct Armor”? There’s a ton of marketing information on the internet, but not much that’s on actual results. On one hand, it looks like the stuff used for trenchless drain replacements. On the other hand, it looks like a scam (who can possibly inspect the results). I’ll actually be mentioning Duct Armor in next week’s blog post about water in the ducts. I’ve never seen it installed, but we had a guy come out to our local ASHI meeting to talk about that stuff, and I was sold on it. It won’t keep water out of the ducts, but it’ll do just about everything else. I wouldn’t hesitate to try it. As usual, Reuben is right on from my POV + 30 years asbestos inspections! Good informative work! This is great. I often refer to them as in-slab ducts, but will now start calling them sub-slab ducts. 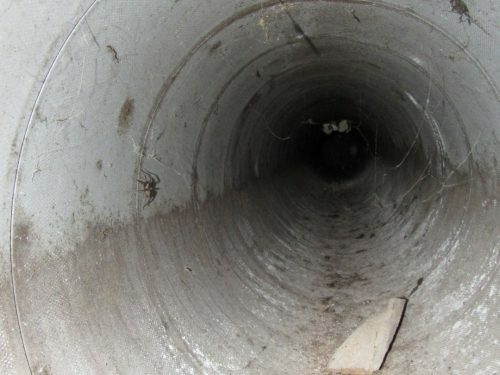 I agree that most are now PVC…some of the old sheet metal ducts have rusted out, allowing mice and rats to enter. I have one client in a slab on grade townhouse near wet lands with snakes entering her ducts; the home owners association tells the homeowners not to clean their ducts because they will get more cracks and more snakes! So she has to live with mold, because these ducts are major mold growers. One of my clients nearly died from her sub-slab ducts when stagnant water in the ducts caused bacteria to enter the HVAC which caused a lung infection that went sepsis. So frustrating! Thank you, Vickie! Yes, the old metal ducts are definitely bad news. It’s hard to believe that anyone thought those were a good idea. The first time I saw that done, I couldn’t believe what I was seeing.